We’re all in business to make a profit. Making money is not a topic that’s talked about ENOUGH with small business owners. After all, the spotlight is often shining on how many followers and likes you can get on social media. Or how many times you go LIVE on Facebook every week. All of this talk about social media follower counts is focused on ego-driven metrics. We need to shift the dialogue to focus on CONVERSIONS, which lead to the one thing your business needs to stay in business: INCOME. There is little reason to be in business if you are not generating an income. All of the altruistic energy in the world will not keep your refrigerator stocked and your lights on. So we’re going to live in the real world and talk about growing income today, okay? 1) Where is the traffic coming from, and how can you get more? Get more traffic from various sources. This should always be a priority and something you work on regularly. Track your growth as you move along and keep an eye out for fresh new ideas to boost your traffic. Using paid ads is totally fine here, if you have a defined target audience and something to offer said audience. For example, if you want to increase your paid traffic, you could run Facebook ads promoting subscriber-only deals (for ecommerce shops). Or, your Facebook ads could promote your free webinar and target specific demographics. Nobody said you have to rely exclusively on organic traffic. Nobody. 2) Your next focus should be getting more subscribers. As you start to get more traffic, your list will start to grow, but don’t stop there. Tweak your opt in-forms to increase conversion. Create a new lead magnet to get the attention of a different sub-group of your target audience. Set up a few dedicated opt-in pages and start driving traffic to them. Do what you can to continually grow your list and pick up speed in the process. 3) The third piece of the puzzle is turning those subscribers into customers. This is where things get real interesting. You want them to spend money with you either by buying your products and services, or through your affiliate links. Offer more products. Raise your prices. Find more attractive offers you can promote as an affiliate. Work on your funnels. There’s a lot you can do to grow your bottom line once you have traffic and subscribers figured out. The real power of this approach becomes apparent when you start to look at how these three things work in synergy. By getting more and higher quality traffic, while improving your opt-in rates, and creating higher prices products with sales funnels that convert well, you can quickly make a huge difference in your bottom line. Each of these elements alone will help, but by combining them, you will start to see exponential growth. Let me illustrate this with an example. Let’s say you start out with 100 new visitors per day. 10 percent of them sign up for your mailing list, which comes out to 10 new subscribers each day. One of these people buys one of your products at $10. Now let’s see you double your traffic. With nothing else changing, you go from making $10 per day to $20. But what if you can also improve your opt-in forms and get to a 20% conversion. You also create a few more products (and/or upsells) and each of your customers ends up spending 3 times as much as before. When we add all that up you go from making $10 per day to 40 new subscribers each day which means 4 new customers. If each of them spends $30 shopping around in your shop, you end up making $120. That’s a pretty big bump from $10 while still only requiring you to double your traffic. Pretty impressive, isn’t it? 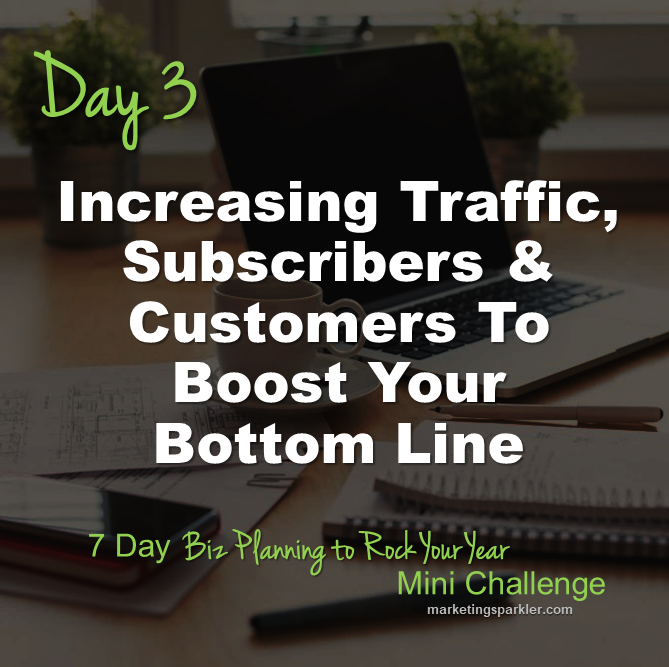 The 7 Days of Biz Planning to Rock Your Year Mini Challenge is a free, 7-day series for entrepreneurs that can be started at any time. Register and each day you’ll get an email from me with tip or a strategy designed to help you make plans for growing your business. We’re not talking fluff-n-stuff here. These are hands-on, actionable tips and strategies you can use every day to embrace planning, set ambitious goals, and then work towards reaching them. Click here to sign up for the full challenge.